From personal experience, storing necklaces in a drawer or jewelry box all together creates a NEVER-ENDING VORTEX of tangles as if the universe just doesn't want me to wear a necklace that day. 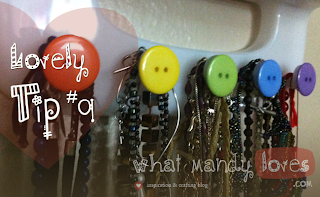 After finding this wall-hanging jewelry display, I knew my detangling problems would diminish. Another plus is that I can organize them into sections based on length and thickness and color and YAY organizing! The only negative was OH HOW BORING it all looked together! The slick plastic is almost impossible to paint without chipping, and the circular smooth knobs stick out awkwardly to keep the necklaces from sliding off. The knobs themselves gave me an idea on how to add some pizazz. Glue some buttons onto a jewelry display on smooth flat surfaces such as knobs, sides, or lids. I purposely purchased a small set of buttons for this on Etsy since the only ones I have were too small. Any glue will do if the buttons will not be touched much, but I suggest hot glue or craft glue for this in case the buttons get pulled. Buttons will look great all over the outside of a jewelry box, too! In case you're wondering, this jewelry display is made by 3M so it can be found at almost any craft store that sells their wall hooks. I use it for all my little funky necklaces, rings, charms, and pendants while all my bracelets call my jewelry box home and my hair bands hang on other knobs. How do you display your jewelry? What have you done to make the display as pizzazz-y as you necklace collection? Let me know in the comments.